Science does not change by opinion. As with all things, in order to understand what something means, you have to know the context. A fact by itself can easily be spun. When you have the correct context, the spin falls away and what is left is reality, or at least a more reasoned understanding. On RealClimate: Gavin Schmidt (NASA/GISS) Kevin Wood, (Joint Institute for the Study of the Atmosphere and Ocean, University of Washington) Eric Steig, (Department of Earth and Space Sciences, University of Washington) have provided extensive review in multiple posts. I will attempt to summarize the review here as simply as possible. When the emails are read in context they reveal that there are no egregious improprieties with regards to the accusations of falsifying or misrepresenting science. The quotes being bandied about carelessly in the media, in support of the denial of human caused global warming, are using the quotes outside of their actual context. This unfortunately gives a false impression that is then used to support the notion that the science is somehow a grand conspiracy. Back in a little place called reality, the email communications express the normal back and forth of scientists trying to work out complex problems and in some cases their frustrations with those that choose to misrepresent the science (such as Steve McIntyre). The language is casual as one might expect in private communications and expresses real and justifiable concerns involved with those in the denialist campaign. "A fair reading of the e-mails reveals nothing to support the denialists' conspiracy theories. In one of the more controversial exchanges, UEA scientists sharply criticized the quality of two papers that question the uniqueness of recent global warming (S. McIntyre and R. McKitrick Energy Environ. 14, 751–771; 2003 and W. Soon and S. Baliunas Clim. Res. 23, 89–110; 2003) and vowed to keep at least the first paper out of the upcoming Fourth Assessment Report of the Intergovernmental Panel on Climate Change (IPCC). Whatever the e-mail authors may have said to one another in (supposed) privacy, however, what matters is how they acted. And the fact is that, in the end, neither they nor the IPCC suppressed anything: when the assessment report was published in 2007 it referenced and discussed both papers." Has climate data been destroyed? Kevin is discussing short term variation that involved natural variation on a year to year basis. It is important to understand that climate is long term (30+ years) while weather and internal variability (weather/natural variability) is considered on shorter time scales. "Mike's nature trick" & "hide the decline"
The term trick in this usage/context means applying a method. Applying various methods is how scientists test different ideas and then compare the results to actual observations. This is normal in the scientific process. Nothing deceptive here. 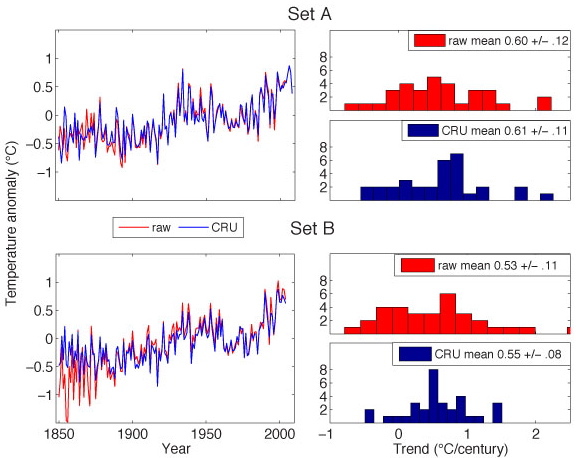 The paper in question is the Mann, Bradley and Hughes (1998) Nature paper on the original multiproxy temperature reconstruction, and the ‘trick’ is just to plot the instrumental records along with reconstruction so that the context of the recent warming is clear. Scientists often use the term “trick” to refer to a “a good way to deal with a problem”, rather than something that is “secret”, and so there is nothing problematic in this at all. As for the ‘decline’, it is well known that Keith Briffa’s maximum latewood tree ring density proxy diverges from the temperature records after 1960 (this is more commonly known as the “divergence problem”–see e.g. the recent discussion in this paper) and has been discussed in the literature since Briffa et al in Nature in 1998 (Nature, 391, 678-682). Comment: Steve McIntyre, who you have mentioned on these threads, takes serious issue with your explanation of the “hide the decline” statement. The usefulness of tree-ring data and/or reality of AGW are not the issues here. McIntyre is leveling charges of impropriety and fraud, and quite frankly, his explanation makes a lot more sense than the one posted on this website. Fact: The IPCC's primary conclusions are based on an assessment of thousands of individual studies and collective insights from the comprehensive climate science literature. Although many errors were alleged, EPA confirmed only two errors. The small number of documented errors are not central to IPCC's main conclusions or to EPA’s Endangerment Finding. In a report of such magnitude, a few errors do not undermine the credibility of the entire work of the IPCC. The process used by the IPCC stands as one of the most comprehensive, rigorous, and transparent ever conducted on a complex set of scientific issues.